Presented August 1, 2018 to the Bible Faculty Summit, Bob Jones University, Greenville, South Carolina. In both instances, the word of God is affirmed as authoritative and sufficient, and in both situations, other resources help to set or complete the context. Considering these and other Biblical scenarios, this paper evaluates the nature of Biblical authority and sufficiency and the role of extra-Biblical resources in transformative teaching and learning. To underscore the practical value of the authority and sufficiency issues, this study also compares principles observed in the Biblical narratives with principles employed in psychology and counseling, providing a case study for the application of extra-Biblical resources in transformative teaching and learning contexts. Within Christianity there are three primary perspectives on the relationship of Biblical authority and Biblical tradition. The first (B+T) views the Bible as authoritative, but also views Tradition (with a capital T) as provided by God and as equally authoritative. The Roman Catholic Church (RCC), for example, embraces this approach. The second (B+t) views the Bible as authoritative, but views tradition (little t) as a necessary hermeneutic lens through which to view the Bible. Reformed and Covenant theology take this view. The third (B+Ø) holds to the idea that the Bible is exclusively authoritative, and that while tradition is important for understanding contexts and interacting with people, it is neither a source of doctrinal authority nor a hermeneutic aid. This third approach is distinctive in its a commitment to applying sola scriptura in every area of faith and practice. The second major difference is in the related ideas of ex cathedra and apostolic succession. In Catholic understanding, the Church is built on Peter, the unshakeable rock of the church.9 Thus from Peter the church gains her authority, and the Popes derive their ex cathedra authority. In Protestant understanding, Jesus is the rock upon which the church is built, being the rock of offense, and a fulfillment of Isaiah 8:14, as acknowledged by Peter in 1 Peter 2:8. This variance in interpretation sets distinct trajectories for both groups – Catholics finding revelation to extend beyond the biblical text, and Protestants, asserting that revelation goes no further than the completed texts that Jesus affirmed and commissioned. Consequently, the divergent epistemological moorings contribute to the disparate (and at times violently so) theological conclusions. Because Jerome included apocryphal books in his Vulgate translation, (possibly based on their inclusion in the Greek Codex Sinaiticus) those books remain an esteemed component of the Catholic Bible. These texts are typically rejected by Protestants on grounds that they are historically separated from the Hebrew OT, and based on some of the doctrinal conclusions the apocryphal books derive.20 These disputed texts represent a point of division between Catholic and Protestant, as the Council of Trent in 1546 codified the Apocrypha to be inspired, cementing that aspect of disagreement. While English translations of the OT contain around 600,000 words, and the NT contains around 175,000 words, the Apocrypha includes about 160,000. Because the Apocrypha is nearly the size of the NT, the textual basis for Catholic and Protestant disagreement is not insignificant, nor are the doctrinal distinctions unimportant. The most severe of these differences is evident in the context of how a person is justified before God. Virtually every single one of Luther’s 95 Theses pertain to issues relating to how one is justified, and the implications for remission of sins, purgatory, papal authority, the use of indulgences, etc. Luther was largely protesting what he perceived to be a taught doctrine of salvation by works, and added to his translation of Romans 3:28 the word “alone,” in order to ensure the understanding that justification comes by faith alone. On the other hand, Catholic soteriology agrees that “Believing in Jesus Christ and in the One who sent him for our salvation is necessary for obtaining that salvation,”21 and ”without faith no one has ever attained justification.”22 Still, that “We can lose this priceless gift”23 illustrates that justification, in the Catholic soteriological system, is not by faith alone. In these contexts – understandings of what constitutes Scripture, the exclusivity of biblical authority, and hermeneutic methodology, the essential source of authority is ultimately not the same for Protestantism and Catholicism. If in a biblical worldview the source of authority is God as revealed in the Bible, then the Bible is the final and unaugmented record of God’s outline for worldview, including descriptive aspects of epistemological and metaphysical concepts, and prescriptive aspects of the ethics and socio political thought. In a Catholic worldview, the source of authority is still recognized as the biblical God, but He reveals Himself in more diverse ways than simply the pages of the Bible. 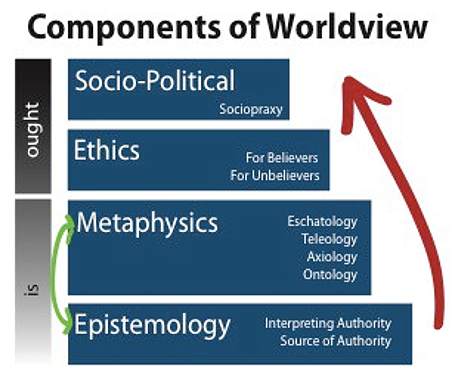 Consequently, there are differences between Catholicism and Protestantism in both the descriptive elements of worldview (epistemology and metaphysics) and the prescriptive elements (ethics and socio-political). Cornelius Van Til is astute on three significant pillars of Biblical epistemology: (1), the Biblical God exists, (2) He has revealed himself authoritatively, and (3) Natural man’s incapacity to receive, but his epistemology falls short in that he does not account for hermeneutics (Pillar 4) within his epistemology. In fact, in his Th.M thesis, “Reformed Epistemology,” Van Til does not discuss Biblical interpretation. Much of his critique of other thinkers, like Kant, includes considerable discussion of their deficiencies in the interpretation of experience, but not a word about method in interpreting Scripture. It is surprising to this writer that Van Til would build such an outstanding foundational framework on special revelation and then totally ignore the centrality of hermeneutic method for understanding that revelation, because Biblical hermeneutics as an absolutely necessary component of epistemology. In his The New Hermeneutic, Van Til concludes, with these words, “…we would appeal to the Cahier’s men, to Wiersinga and to others, to build their hermeneutical procedures on the theology of Calvin, Kuyper, Bavinck, etc., (emphasis mine) and then in terms of it to challenge all men to repentance and faith in the self-identifying Christ of Scripture instead of making compromise with unbelief.”28 Notice his prescribed hermeneutical procedures are grounded in historical theology, rather than literal grammatical-historical. In short, Van Til is marvelously consistent in his epistemological method until he prescribes historical theology as the orthodox hermeneutic, rather than literal grammatical-historical (an unfortunate contradiction of his own expertly stated first principles). While Van Til and DeYoung do not attribute inspired authority to tradition (as does the RCC), their handling of Scripture does not reflect much practical difference. In practice, B+T and B+t are closely related. The related ideas of a completed canon and the superior reliability of revelation over personal experience are important bases for sola scriptura in understanding and in application. Peter illustrates the principle of revelation trumping personal experience when he explains that even though he had witnessed Christ in His glory at the transfiguration,34 the prophetic word regarding Christ – or God’s revelation – confirmed the issue.35 What Peter says on this subject is important, because even if God did presently use experiential or sensory means, it would be secondary to His word. Peter also describes in those verses how God spoke to people – the Holy Spirit moved men to speak the word of God.36 Certainly, God did speak to people in dreams and other ways.37 And Paul agrees that all Scripture is God-breathed.38 Still, in 1 Corinthians 13 Paul describes how the confirming gifts of tongues, prophecy, and knowledge – gifts whereby God spoke to people – would fulfill their purpose and come to a conclusion. In a context describing the superiority of love,39 Paul explains that the gift of tongues would cease on its own.40 Tongues was a gift which enabled people to speak God’s word in actual languages that the speaker didn’t understand. This is illustrated in Acts 2:9-11, a passage which includes a list of at least sixteen different languages or dialects by which God used the disciples (and those who were with them) to proclaim God’s gospel. This gift served as a sign to unbelievers,41 to show that God had sent His Holy Spirit.42 Paul rebuked the Corinthian church for not utilizing the gift properly at times, and challenged them regarding the importance of love. After that commentary in 1 Corinthians, written in about 51 AD, the Bible never mentions the gift of tongues again – not even in the letter Paul wrote to that same church just a few months later. Very early in church history, the gift of tongues had fulfilled its purpose and ceased on its own, just as Paul indicated it would. Hebrews 1:1-2 tells us that while God used many methods in former times to communicate, in these last days, He “has spoken to us in His Son.” Jesus prepared His disciples for His ascension, telling them the Holy Spirit would come to guide them into all the truth.48 Upon His departure, He reminded them to “make disciples…teaching them to observe all that I commanded you.”49 The Holy Spirit fulfilled that ministry of guiding the disciples into all the truth, as Peter says, “men moved by the Holy Spirit spoke from God.”50 From a textually verifiable standpoint, Jesus’ communication, through the Holy Spirit to His disciples, was finished at the end of the book of Revelation. If the closed canon provides clarity regarding the source of authority (God as revealed in the Bible) in a Biblical worldview, then the opening narrative provided in that canon models a hermeneutic pattern for how we should understand Scripture. In order to arrive at a reliable and predictable approach for interpreting Scriptures, the interpretive method ought to be exegetically derived from within the Scriptural text. Otherwise, there can be no claim to hermeneutic certainty, because any externally derived interpretive method can be preferred and applied simply by exerting presuppositions upon the text. In the case of an externally derived hermeneutic, presuppositions leading to that hermeneutic conclusion create a pre-understanding that predetermines meaning independent of the author’s intentions. The outcome, in such a case, can be wildly different than what the author had in mind. If the Bible is merely a collection of ancient stories, legends, and myth, interspersed with mildly historical accounts, then the stakes are not particularly high. The greatest damage we can inflict by a faulty hermeneutic method is of the same weight as misunderstanding the motivations and activities of Mark Twain’s adventurous character, Tom Sawyer, for example. In such an instance we would simply fail to recognize the aesthetic virtues of a creative work. However, if the Bible constitutes an actual revelation from God, then it bears the very authority of the Author, Himself – an authority that extends to every aspect of life and conduct. These are high stakes, indeed. If we fail to engage the text with the interpretive approach intended by its Author, then we fail not just to appreciate aesthetic qualities, but we fail to grasp who God is, and what He intends for us to do. It is incumbent, then, upon readers of the text to carefully derive hermeneutic method from the Scriptures themselves. Yet, this responsibility is complicated by an obvious absence of prescriptive material within the Biblical text that if present could direct readers toward a particular interpretive stance. In the absence of such prescriptive material, we examine here some descriptive elements from the book of Genesis, in order to discover whether or not there is actually a prevailing hermeneutic embedded in the text itself. From the opening of Genesis to its conclusion, the book records roughly two thousand years of history. Further, Genesis alleges that these two thousand years are the first years of human history.51 Within that framework of chronology, the events in the book of Genesis account for the first 33% of our recorded six thousand year history and the first 50% of the four thousand years of Biblical history. If Genesis were univocal regarding hermeneutic method, that single voice would go a long way in helping us understand how the Author intended for us to interpret the Scriptures. Genesis would be a guiding light, providing the time-tested descriptive model foundational to our Scriptural hermeneutics. Other than the eighty-four verses in Genesis evidencing a model for interpreting Scripture, there are ten similar passages in Job that provide a secondary support to the monolithic hermeneutic method evident thus far in Genesis. In each instance of Divine speech acts in Job, the speaker is identified as “the Lord.”53 In these ten verses, we find ten C1’s and zero C2’s. Notably, one of the C1 responses is from God, Himself.54 Job’s record of God’s speech acts and the responses indicates there is no deviation from the pattern modeled in Genesis. Further, Job’s response to God’s use of metaphorical language in chapters 40-41 indicates that the Divine use of figurative language did not change the expectation that what was verbally expressed should be interpreted in a basic, face-value, common-sense way. In short, the addition of figurative language did not result in any adjustment to the hermeneutic method. In examination of the ninety-four passages in Genesis and Job that record Divine speech acts, the evidence is overwhelming (eighty-one C1’s to absolutely zero C2’s) that God intended for His words to be taken at face value, using a plain-sense interpretive approach. The hermeneutic method that reflects this straightforward methodology has become known as the literal grammatical historical hermeneutic. This method recognizes that verbal expression has meaning rooted in and inseparable from the grammatical and historical context of the language used, and that these components require that readers be consistent in applying the interpretive method in their study of the Scriptures. Because of the two-thousand-year precedent evident in Genesis and Job, any departure from the simplicity of this method bears a strong exegetical burden of proof, requiring that there be explicit exegetical support for any change one might perceive as necessary in handling later Scriptures. Absent any such exegetical data, we can conclude that (1) hermeneutic methodology for understanding Scripture is not arbitrary but is instead plainly modeled, and that (2) later Scriptures should be understood in light of the hermeneutic precedent provided by Genesis and Job. 3 Matthew 4:4, from Deuteronomy 8:3. 5 Portions of this section adapted from Christopher Cone, “Authority of Scripture and Hermeneutic Method as Historical and Continual Bases for Christian Unity and the Collaborative Avenues They Imply,” a paper presented to the Florovsky Week Symposium, Newman University, Wichita, Kansas, July 11, 2018. 10 Pope Pius XII, “Divino Afflante Spirito,” Paragraph 9. 20 E.g., 2 Maccabees considers prayer and sacrificial offerings for the dead, the merits of the martyrs, and intercession of saints; Tobit 12:9 and 14:11 seems to suggest that almsgiving purges sin; 1 Maccabees 2:52 suggests that Abraham’s passing the test was reckoned to him as righteousness, not his believe in the Lord (as in Gen 15:6); 2 Maccabees 12:41-45 presents the doctrine of purgatory; and 2 Maccabees also considers sacrificial offerings for the dead, the merits of the martyrs, and intercession of saints, etc. 24 Pope Pius XII, “Divino Afflante Spirito,” 23. 26 Frederic Farrar, History of Interpretation (London: McMillan and Co., 1886), 327. 28 Cornelius Van Til, The New Hermeneutic (Philipsburg, NJ: Presbyterian and Reformed, 1974), 180. 29Kevin DeYoung, “Your Theological System Should Tell You How to Exegete,” The Gospel Coalition, February, 23, 2012, viewed at https://www.thegospelcoalition.org/blogs/kevin-deyoung/your-theological-system-should-tell-you-how-to-exegete/. 31 Kevin DeYoung, “Theological Primer: The 144,000,” The Gospel Coalition, April 28, 2017, viewed at https://www.thegospelcoalition.org/blogs/kevin-deyoung/theological-primer-the-144000/. 34 Mt 16:28-17:2; 2 Pet 1:16-18. 42 Acts 2:36-38, 10:45-46, 19:5-6. 51 C.f., Gen 1:27 and 5:1. 52 Christopher Cone, Priority in Biblical Hermeneutics and Theological Method (Raymore, MO: Exegetica Publishing, 2017), 17-36. This portion is foundational/context for parts 2 and 3, which work toward the question of biblical counseling, psychology, and other disciplines that make use of information outside of the Bible in efforts to help people change. A key question that interests me is what are the boundaries of Scripture's sufficiency claim? That is, what does it claim to be sufficient for, and at what point do we properly expect to need to look elsewhere for information? Further, Job’s response to God’s use of metaphorical language in chapters 40-41 indicates that the Divine use of figurative language did not change the expectation that what was verbally expressed should be interpreted in a basic, face-value, common-sense way. In short, the addition of figurative language did not result in any adjustment to the hermeneutic method. Doesn't the occasional use of figurative language require our common sense to be educated somehow? For example, in Job 38:22-23, God says "Have you entered the storehouses of snow or seen the storehouses of hail, which I hold in reserve for times of trouble, for the day of war and battle?" We can understand from out knowledge of precipitation that there are no storehouses of snow and hail that could be entered, so this must be figurative. However, would Job have known that, or would his face value interpretation of God's statement have led him to think of a physical storehouse of snow or of hail that could be entered, but which he didn't have access to? Are we to interpret this verse based on our current knowledge or on what Job would have understood it to mean? I'm not sure we know anything Job didn't know on that. That is, who's to say what a literal storehouse is in reference to such a Being and, with that in mind how do we know He doesn't have one? But more to the point, how would Job's taking the statement literally or figuratively impact the point God is making? So are you saying we should be more concerned with the point or the message ultimately being conveyed than we are with the actual words used to make that point? No, I'm saying that there are only two possibilities for that particular expression: either it's literal or it's a metaphor. Since God's point is, "You don't really know how I make the created world work," the point is made, whether there is a mysterious literal storehouse or a mysterious metaphorical storehouse. It sure looks like a metaphor to me, though. Does the Bible alone give you the information that makes it look like a metaphor, or does your knowledge of the world from outsides sources cause you to say that it looks like a metaphor? I can't claim any expertise in epistemology... it has never held my interest. What I'll venture to say is that the nature of language itself seems to be that it is dependent on reference to things outside itself for meaning. That is, every word draws meaning in relation to every other word, other words, and every document is dependent on information outside itself in order to be read. In the case of Scripture, whenever it's talking about something other than itself (which is most of the time), it's drawing on information outside itself in order to communicate. At the very least the referent of a word is not the Bible. So when it says "In the beginning God created," beginning is not the Bible, God is not the Bible and creation is not the Bible. I don't think anybody claims that the Bible is meant to be understood without reference to knowledge outside it. It seems to me that all knowledge is dependent on other knowledge in order to be understood. It's just how communication works. Would this include not just the definition of words and the concept of metaphors but also the idea of literary styles? I've always understood that the books of poetry are meant to be taken more figuratively that the historical books. Is it possible to accurately understand the Bible without taking into account literary styles? I meant "literary genres" in my last post rather than "literary styles," but I thought of that way past the editing time. I do believe some understanding of literary styles is vital, yes. Also, I want to qualify what I said earlier about not being interested in epistemology... what I'm trying to say about that is that it hasn't sustained my interest long enough to result in a high level of confidence that I "get it." I can't claim to have worked through it. I admire those who engage in that work. In my mind, it all seems to become very circular very quickly... and so, frustrating. About genres and interpretation, though... I see interpretation as a kind of filtering process--whether it's biblical interp., or interp. of a letter from a friend. We read, and simultaneously eliminate options from the range of possible meanings as we go on. Seems to me that we do the same thing listening in conversation. Using information from what we know intuitively (more on that in a minute), our own experience, what we've learned from others, what we know of the speaker, etc., we suss out what he/she is saying to us. If interp. is narrowing/filtering down the number of possibilities and assigning increasing probability to the ones that remain, people can do quite a lot of interpreting without knowing about genres. But they end up with a larger range of possible meanings and selecting the wrong ones a % of the time. But when it comes to knowledge of the figurative/metaphor and poetry, I'm not sure this isn't intuitive, at least to some extent. How old are we when we start saying things like "I laughed my head off"? The idea of metaphor seems to be built in knowledge. (I am definitely not persuaded of Locke's tabula rasa).